I'm wondering if a reader can bring to light a plausible explanation for the strange occurrences among Tallahassee MLS real estate listings over the past two months. In case you missed its release a few days ago, we published the Manausa Market Infographic for the month of March and it shows a continuing trend that is both alarming as well as mysterious. Please take a look at our infographic and tell me what is going on in Tallahassee? They say that a picture is worth 1,000 words, though this was disproved by a classmate of mine at West Point when he tried to submit a 9,000 word paper with a picture in lieu of the 10,000 word assignment that was due. Nevertheless, I prefer to use visual images such as charts, graphs, and diagrams for the purpose of representing data or information in an easily understandable manner. 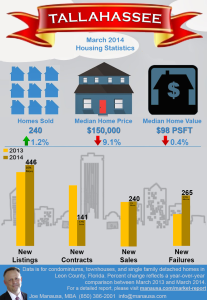 This is why our monthly infographic is so important when analyzing the Tallahassee real estate market. So what big mystery did our new infographic unveil? Well, if you look at the bar charts that compare March 2014 with March 2013, you will see growth in three of the four measured statistics. In March, there were more new listings, more new closed sales, and even more failures (homes that left the market without selling) than there were in March of last year. But the second bar chart shows that new contracts were down 57% last month! And in the February Infographic, we saw new contracts down 25% when compared to February of 2013. So what does this mean? 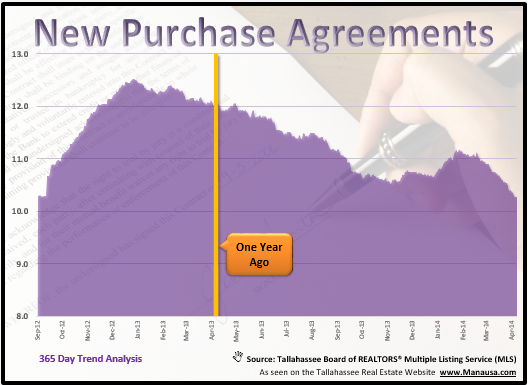 Is Homebuyer Activity Declining In Tallahassee? If we were to only study new contracts (MLS real estate listings that changed to contingent or pending status), we would have to conclude that buyers are leaving the market at a fairly rapid pace. In fact, when we graph new contracts alone, we see a steady declining trend turn into a fairly rapid declining trend this year. But this is not the only 365 day trend that we study, as we know we must monitor the entire market in order to stay ahead of coming changes. And that is where the mystery unfolds. 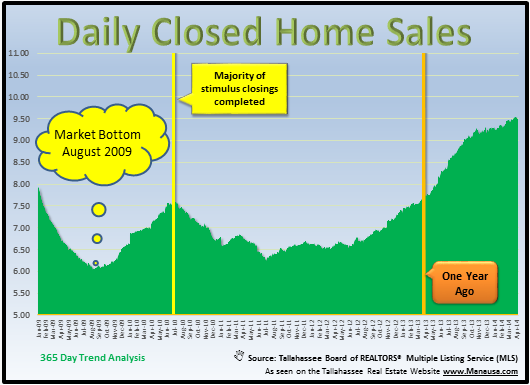 The following real estate graph shows the 365 day trend of closed home sales in Tallahassee. As you can see, it is quite opposite of what we observed when looking at new contracts. So we have new contracts declining, but closed sales are on a steady climb. Just to clarify, this means that fewer people are "agreeing" to buy real estate while simultaneously more people are taking ownership of homes every day. How can these diametrically opposing trends continue? I would love to see our local and national readers opine on what is happening in the Tallahassee real estate market. I have a few theories that I will share in the near future, but I do not want to taint the thoughts of our readers who might be able to solve this mystery. So if you think you have an idea of why new contracts on Tallahassee MLS real estate listings are slowing, all the while closed sales are on the rise, simply leave a comment below (preferably through the Google Plus portal) and help us solve this mystery.